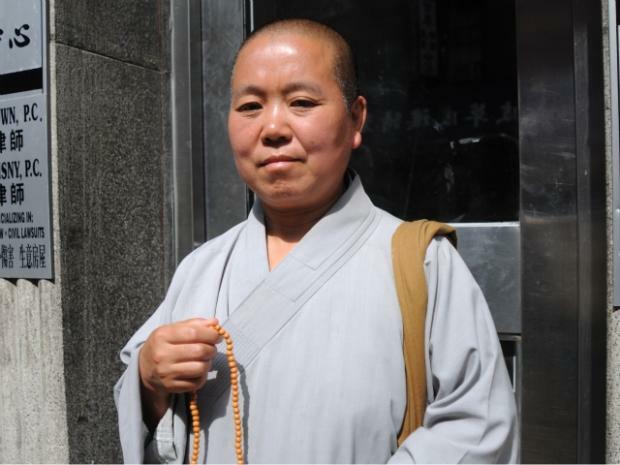 CHINATOWN — A Buddhist nun giving out prayer beads on Canal Street to raise money to rebuild her burned down temple was arrested and detained for several hours without an interpreter, she told DNAinfo. Police charged Baojing Li, 48, with acting as an unlicensed vendor, a misdemeanor. They claim she hawked costume jewelry at the corner of Canal and Mott Streets on June 2 without a license from the state Department of Consumer Affairs. But the religious woman, who wears a traditional Buddhist robe and has a shaven head, says she was not selling the 50-cent strands of prayer beads, but handing them out to generous people who dropped donations in her collection tin. Li said she had a sign placed next to her stool — written in red Chinese calligraphy — telling would-be donors that she needed help rebuilding her temple and home in Chamblee, in Georgia. The building burned down on March 26, according to the official fire incident report. The Chinese native, who came to the U.S. to do missionary work in 1996, wept as she said police approached her on the street, handcuffed her and took her to the Midtown South precinct where she said she was held for four hours without knowing what was happening. "I had no idea what [was] going on. I don't know," Li said in her lawyer's office Monday, fighting back tears while telling the story through a translator. "Nobody explained whatsoever," she added. Li was issued a desk appearance ticket and ordered to appear in Midtown Community Court on July 7. If convicted, she could face up to three months in jail and a $3,000 fine. Her attorney, Robert Brown, said he agreed to take Li's case pro bono after hearing her story. Li came to New York in April in hopes of getting help from Manhattan's large Chinese population, she said. She has been living at an East Broadway Buddhist temple, and has already raised $10,000 of the $30,000 she needs thanks to donations from New Yorkers and coverage in the Chinese-language press, she said. Brown added that a passerby tried to intervene during the arrest, telling police that she was raising money for charity and not selling the beads, but the explanation fell on deaf ears. Brown said Li was swept up by the NYPD's Manhattan South peddlers task force, and that the police reaction could have been driven by a misunderstanding of Buddhist culture. "If this were a Catholic nun (with) rosary beads I think they would have realized the religious significance a little more," Brown said. "The police in this case exhibited an astounding lack of common sense," he added. The district attorney's office would not comment on Li's case or whether they'll pursue the charges.